A weekend outing, a day at the mall or off on a date, this two piece set cannot-be-missed. Soft dove gray tote defines your style! 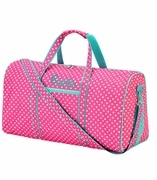 The tote is large with one main compartment, ideal to hold all your essentials and more. When you need extra space for that weekend away, the set comes with a fabulous matching bag in the same faux leather look. Long handles on both items offer the choice of carrying by hand or slinging over a shoulder. Perfect to pair with denim jeans for daytime or dress up with a classy little black number for a wow-factor at night. Use together as a set or mix and match as the mood takes you. MONOGRAM WILL BE PLACED ON THE CROSS BODY BAG ONLY. 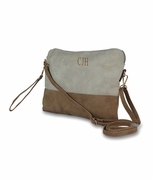 Monogrammed faux leather tote bag measures 18"W x 12"H x 4" across the bottom. Black edging trim on side and bottom. Silver turn key latch. Smaller cross body bag measures 13.5"W x 10"H x 3.5" across bottom. Poly-cotton lining matches exterior, interior cell and eyeglass compartments. Exterior zip pocket and zipper closure.